So, I was very happy recently when I finally managed to use up my old Shea body scrub from The Body Shop - it meant it was about time to try a new one, namely the Coconut one, which I 'd been wanting to try for quite some time now! I cannot stress enough how delicious all of these products smell! The Coconut line has probably the best coconut scent any product could have: nothing like the artificial coconut-resembling scent that so many products out there have (and I have tried many of those). It's a true coconut scent (thanks to the organic virgin coconut oil) and it has a creamy/buttery aspect to it, it's rich, but not overpowering or overly sweet, and can leave the skin lightly scented for hours! I 'm especially loving the body scrub, it contains medium size coconut shell granules and it exfoliates really well, without irritating the skin (I found the Shea one a bit too harsh, even though it was supposed to work well with my very dry skin). The shower cream is lovely and already well used! It leaves the skin moisturised, however being a soap-free cream, it doesn't lather that well, which is unlike the shower gel products I 'm used to. The body butter is another great product and it sinks in almost immediately, my skin seems to "drink" this, so definitely another product I 'll be buying in full size soon! The soap is the only one I have yet to try - apparently it contains real coconut flakes, so can't wait to try that too! As for the hair, I couldn't leave it neglected could I? I 'd heard good things about the Honey moisturizing shampoo, so I decided to give it a go. Another product with an amazing scent: it's almond-honey like, super lush, honestly better than what they use at my hair salon! It's suited for dry, damaged or chemically treated hair (triple check for me) and it actually works, my hair seems to be a bit more manageable than before and a wee bit smoother, I 'd probably be trying the conditioner soon, to test the combined effect! So, that was it for my TBS haul! Have you tried any of these products and if so, what did you think of them ? 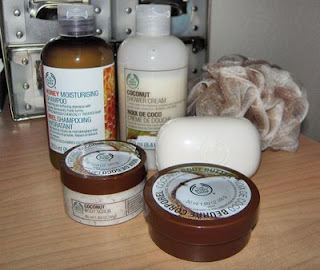 I was eyeing the coconut soap the other night, so I suppose I'll just have to go back and pick it up--umm, along with the shampoo :) great blog! I looove the scrub and soap from the coconut range..so good! great stuff!! Coconut is my fav hair and body smell. TBS stuff always seems to smell nicest doesn't it. Did you every try the Jessica Simpson brand where you could eat the moisturizers?? I did and i felt VERY sick after a few licks.. hmm maybe one day you should create a proper edible coconut body thing. I LOVE coconut!! As soon as I read in a magazine that The Body Shop had a range of coconut products I went and picked up some straight away! I have the body butter and a coconut perfume oil that I use a lot and love. I also have a spray moisturiser that is not as heavy as the body butter and great for day but also kind of sticky. I have used the soap before and I really like it. Its just a tiny bottle of pure coconut oil they sell.. i put it on my pulse points and during the day when you least expect it you still smell coconut! !